Farming First Nutrition Video from Farming First on Vimeo. Food security is not only about the quantity of food which we consume; it is also about the quality and diversity of that food as well. Continued focus on improving agricultural productivity is an important precondition to realising food security goals, including nutrition security. But we also need to look at how much choice people have, and the quality of the food they eat. While food security has been placed back high on the political agenda since the food price crisis of 2008, the issue of nutrition insecurity affects one billion people’s health and is related to the deaths of almost 10 million people each year. Malnutrition, often called the “hidden hunger”, can lead on to life-threatening illnesses. Either caused by a lack of protein (protein-energy malnutrition) or micronutrients such as iodine, vitamin A and iron (micronutrient deficiency), malnutrition weakens immune systems, exacerbates the effect of childhood diseases such as measles, malaria, pneumonia and diarrhoea, and can permanently impair long-term physical and cognitive development. 1. 1. Increased productivity through the use of improved agronomic practices, including conservation tillage and crop rotation, which can halt and even reverse the process of soil degradation, helps to prevent nutrient depletion of soils and protect yields. Minimum tillage helps to conserve soil structure, keeping nutrients within the soil rather than being washed away by rainwater into rivers and streams. The selective use of herbicides helps farmers control weeds and prevent pre- and post-harvest losses, especially for delicate, nutrient-rich fruits and vegetables..
2. Biofortified foods are bred to have higher amounts of micronutrients and can help provide essential vitamins and minerals. For instance, Golden Rice contains higher amounts of beta-carotene and iron, with potential benefits for 250 million children who risk blindness due to vitamin A deficiency and 1.4 billion women who suffer from anaemia due to iron deficiency. .
3. Micronutrient-enriched fertilizers improves soil fertility, helping to support higher yields of more nutritious food. Poor soil quality is a significant factor that leads to micronutrient deficiencies in humans – if the soil is not rich in all the necessary nutrients, food products will not contain the necessary nutritional balance. These recommendations can help improve health, boost livelihoods, and address the impacts of climate change, especially in rural areas in developing countries. Yet whilst the cost-effectiveness and efficacy of malnutrition interventions through agriculture have been clearly demonstrated, these activities have yet to be deployed at scale and in tandem with each otherFood security is about not only the quantity of food which we consume; it is also about the quality and diversity of that food as well. Improving agricultural productivity to ensure that all these of these goals are achieved should be a priority of the world’s leaders.While food security has been placed back high on the political agenda in recent years, the related but separate issue of nutrition insecurity contributes to the deaths of almost 10 million people each year and affects one billion people’s health. .
Food security is not only about the quantity of food which we consume; it is also about the quality and diversity of that food as well. Nutrition insecurity contributes to the deaths of almost 10 million people each year and affects one billion people’s health. Malnutrition, often called the “hidden hunger”, can lead on to life-threatening illnesses. Either caused by a lack of protein (protein-energy malnutrition) or micronutrients such as iodine, vitamin A and iron (micronutrient deficiency), malnutrition weakens immune systems, exacerbates the effect of childhood diseases such as measles, malaria, pneumonia and diarrhoea, and can permanently impair long-term physical and cognitive development. Traditionally, nutrition security has been viewed as the realm of health professionals. Yet the nutrition challenge cannot be solved solely by the health sector: farmers are the first nutrient providers and the entire agri-food chain has a vital role to play. Continued focus on improving agricultural productivity is an important prerequisite to realising food security goals, including nutrition security. From increasing the availability of total calories, to specific measures on nutrient deficiencies, agriculture can play an important role in addressing nutrition security. Biofortified foods are bred to have higher amounts of micronutrients and can help provide essential vitamins and minerals. One example is Golden Rice which contains higher amounts of beta-carotene, with potential benefits for 250 million children who risk blindness due to vitamin A deficiency. Similarly, rice with higher amounts of iron could offer significant benefits to 1.4 billion women who suffer from anaemia. Micronutrient-enriched fertilizers improve soil fertility, helping to support higher yields of more nutritious food. Poor soil quality is a significant factor that leads to micronutrient deficiencies in humans – if the soil is not rich in all the necessary nutrients, food products will not contain the necessary nutritional balance. A program in Turkey has used this technique to successfully address zinc deficiencies in their population. Improved agronomic practices can also help. Crop rotation is a good practice to improve productivity but it also encourages food diversity. A rotation of legume, cereal, and oilseed crops has benefits to populations in terms of range of nutrients. Conservation tillage can halt and even reverse the process of soil degradation, helping to prevent nutrient depletion of soils and protect yields. 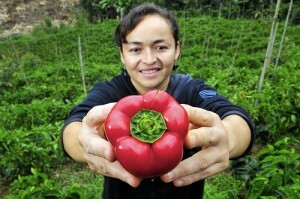 Once food is produced, though, there are still many challenges to get it into people’s hands. In 2010, FAO estimated that poorly developed systems for handling, storage, packaging, transportation, and marketing of agricultural products in developing countries results in post-harvest losses ranging from 15% to a staggering 50%. Investment in food infrastructure and handling could reduce losses and improve food safety. Developed countries also face losses due to food waste from harvest, through delivery to food services, and in households. Waste is worst in fresh fruits and vegetables which deliver vital nutrients to humans around the globe. Nutrition is the foundation for health and development, upon which all the Millennium Development Goals (MDGs) depend. Yet whilst the cost-effectiveness and efficacy of malnutrition interventions through agriculture have been clearly demonstrated, these activities have yet to be deployed at scale and in tandem with each other. Farming First supports the Scaling Up Nutrition (SUN) Initiative and its Thousand Days programme to improve maternal and child nutrition from pregnancy to the age of two. Farming First encourages policy makers to support the SUN initiative and encourage the adoption and implementation of relevant nutrition strategies at country levels. 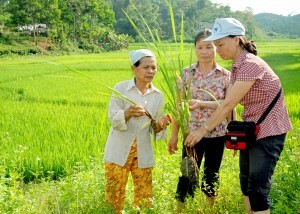 Include agricultural activities in national nutrition strategies and promote the role of farmers as nutrient providers. Train farmers in using appropriate agricultural inputs and techniques that can encourage the production of abundant and nutritious crops and mixed diets, including fruits and vegetables. Highlight the importance of increasing productivity and diversity as an essential component of ensuring access to nutritious foods. Fighting undernutrition is the first step to securing nutrition security. In addition, micronutrient deficiency affects not only people but also plants, livestock and soils. By addressing all forms of micronutrient deficiency, productivity gains can be made and people’s nutrition can be improved. Target farmers, especially women farmers in developing countries, as key partners in improving household nutrition and delivering nutritional interventions, such as dietary supplements. Improve access to markets and encourage healthier food through diversification, market incentives, and consumer education. That includes raising awareness of nutritional challenges throughout the food chain, using marketing and information campaigns. Reduce waste by focusing on harvest losses and consumer waste. In many countries, the lack of agricultural infrastructure and market information does not allow the efficient distribution of agricultural outputs. Conduct further research on nutritional needs in the population, encourage cross-disciplinary research among agricultural, horticultural, nutritional, and medical scientists, and expand biofortification, plant breeding, and micronutrient solutions.